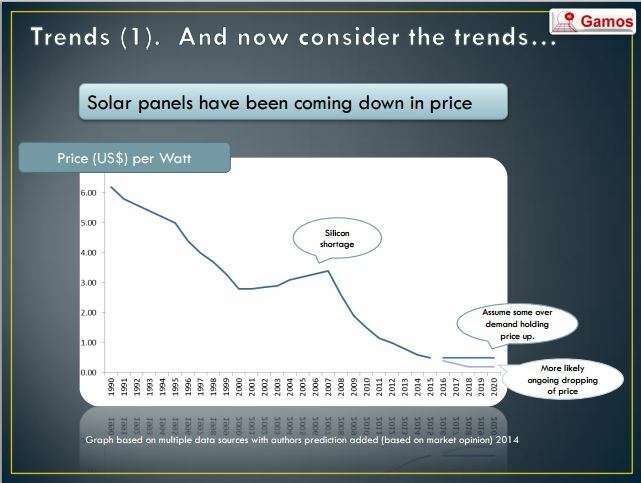 Photovoltaics: What price in 2020? In the past few years solar photo-voltaics have undergone rapid changes in efficiency and cost. Currently the research being conducted by competing companies is improving the efficiencies and reducing the production cost. The industry itself is growing quickly and due to large scale manufacture prices are decreasing. In December 2014, a press release from Fraunhofer announced that 46% efficiency had been reached with a concentrator (multijunction) photovoltaic system. Researchers at Stanford University have been using a layer of perovskite on top of standard silicon as both materials absorb different sections of the solar spectrum, potentially increasing efficiency by 25%. The Economist has reported that John Roberts of the University of Illinois has been working on layers within solar cells which could improve the efficiency to a potential 50% by absorbing different parts of the solar spectrum. Another method to reduce the cost of solar energy is to use the least expensive manufacturing available. Currently, China is the world leader in the production of cheap PV, but hopes for increased production elsewhere means competition might soon force prices even lower. India is expected to reach 100 GW production output in 2022 and the US solar production is expected in double in 2015/ 2016 taking it to 40 GW. Making clear price predictions remain difficult, but it seems inevitable that prices will fall dramatically. The only question is by how much. According to the most optimistic estimates from Citigroup’s energy analysts a price of just $.25/W may be achieved within 2020 (down 700% from today’s prices! ).